New cooling technology makes the Momentum unusually compact and efficient. WESTON, CT, SEPTEMBER 15, 2010 â€” Dan Dâ€™Agostino Inc., a new company founded by famed high-end audio designer Dan Dâ€™Agostino, has announced its first product, the Momentum monoblock amplifier. The Momentum combines extremely high power output with a surprisingly compact form factor and low power consumption. Each Momentum amplifier is rated to deliver 300 watts into 8 ohms, 600 watts into 4 ohms, and 1,200 watts into 2 ohms. Despite its high power output, the Momentum draws less than 1 watt of power in standby modeâ€”far less than most high-powered amplifiers, many of which draw 100 watts or more in standby. 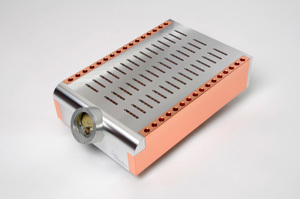 Key to the Momentumâ€™s compact size (just 4 x 12.5 x 18 inches) is its unique cooling technology, which employs copper heat sinks. The thermal conductivity of copper is 91% greater than that of aluminum, making it possible to use smaller heat sinks. For maximum efficiency, the heat sinks use venturis instead of fins. The venturis narrow from 0.75 inches at the top and bottom to 0.5 inches in the middle. As heat expands the air in the top of the venturi, the air is forced upward, thus pulling air in from the bottom of the venturi. Each Momentum amplifier features a front power meter inspired by the design of a Breguet watch face. Each meter features Dan Dâ€™Agostinoâ€™s signature. The large meter and the copper heat sinks give the Momentum a distinctive look, intended to stand out in a field of look-alike high-end amplifiers. No fasteners are visible from front, back, top, or sidesâ€”the unit is assembled entirely from the bottom to give it a clean look reminiscent of the iPhone and the iPad. Momentum amplifiers are built and tested by hand in Dan Dâ€™Agostino Inc.â€™s Connecticut facility. The chassis is machined from solid aluminum billet to provide a sturdier foundation for the circuit boards and to shield against radio-frequency and electromagnetic interference. The circuit boards use through-hole construction, which is sturdier than surface-mount construction and allows the use of higher-quality capacitors. All resistors are 1% metal-film units, and the 28 output transistors are ultra-high-bandwidth models rated for a top speed of 69 MHz. The Momentum amplifier will ship this fall at a suggested price of $42,000 per pair. It will soon be followed by the Momentum preamp, a unique product that combines the functions of a traditional analog preamplifier with a digital media server. For more information on the Dan Dâ€™Agostino company and its products, please visit www.dagostinoinc.com. New line of audio electronics is built in the USA and environmentally friendly. WESTON, CT, SEPTEMBER 15, 2010 â€” Dan Dâ€™Agostino, the worldâ€™s best-known designer of high-end audio products, has announced a new company that will carry his experience and creativity into the coming decades. Dan Dâ€™Agostino Inc. will build high-end audio products in its own facility in the United States. All will be built and tested by hand, and designed for extremely low standby power consumptionâ€”a rare feature in high-end audio. The company will begin shipping its first product, the $42,000-per-pair Momentum monoblock amplifier, this fall. Soon to follow is the Momentum preamp, an innovative product that combines the traditional functions of a high-end analog preamplifier with the ability to play digital audio files stored on computers and hard drives. Dâ€™Agostino is best known as the Chief Engineer of Krell Industries, a company he cofounded in 1980. During his decades at Krell, Dâ€™Agostino became the industryâ€™s most passionate advocate for high-powered high-end amplification. His designs are used by countless speaker manufacturers in their product demonstrations and engineering labs. He sold Krell Industries in 2009, and founded Dan Dâ€™Agostino Inc. in 2010 to extend his engineering and design concepts into an all-new line of audio electronics. â€œWith Dan Dâ€™Agostino Inc., I want to focus on making high-end audio products more user-friendly in every way,â€ Dâ€™Agostino said. â€œThese components are much more compact than the ones Iâ€™ve developed in the past, thanks in part to some innovative cooling technology. They interoperate flawlessly, so theyâ€™re much easier to use than typical high-end audio electronics. Dan Dâ€™Agostino Inc. was founded in 2010 by famed high-end audio designer Dan Dâ€™Agostino. The company designs and builds high-end audio electronics in its Weston, CT facility. All products are built and tested by hand to the highest standards, and all incorporate innovative design and circuit topologies not seen in any other audio products.